This Motherhood Maternity Service Counter Branding makes its statement well above head height and is therefore visible throughout the store. Positioned centrally it allow staff to easily turn to serve customers in a 270º arc from the Service Counter Home Base. See that the counter itself is outfitted in Armored Channel Slatwall and even a pull-out surface should a table be needed. Extra backstock storage is offered behind. 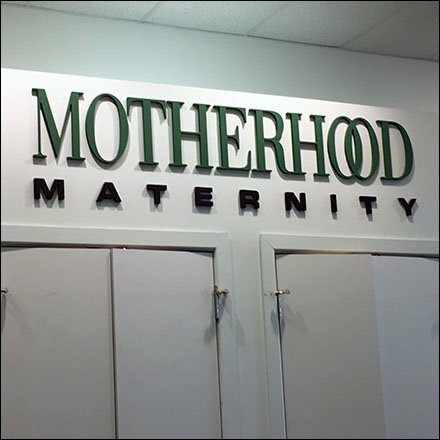 This Motherhood Maternity Service Counter Branding seen at The Shoppes at Montage Ski Resort, PA.